1.00 Richard Straub, Teacher Response as Conversation: More than Casual Talk an Exploration, Rhetoric Review, 1996. 0.51 Richard Straub, The Concept of Control in Teacher Response: Defining the Varieties of "Directive" and "Facilitative" Commentary, College Composition and Communication, 1996. 0.43 Jean Chandler, Positive Control, College Composition and Communication, 1997. 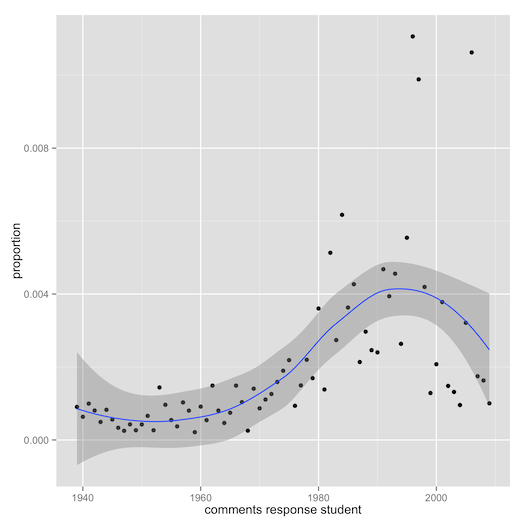 0.41 Richard Straub, Response Rethought, College Composition and Communication, 1997. 0.34 Jane Mathison-Fife Peggy O'Neill, Re-Seeing Research on Response, College Composition and Communication, 1997. 0.30 BC, In Defense of Richard Haswell's Gaining Ground in College Writing: A Counterinterpretation, Rhetoric Review, 1993. 0.29 Jane Mathison Fife Peggy O'Neill, Moving beyond the Written Comment: Narrowing the Gap between Response Practice and Research, College Composition and Communication, 2001. 0.27 Summer Smith, The Genre of the End Comment: Conventions in Teacher Responses to Student Writing, College Composition and Communication, 1997. 0.24 Thomas A. Batt, The Rhetoric of the End Comment, Rhetoric Review, 2005. 0.22 , Excerpts from "Responding to Student Writing", College Composition and Communication, 2006. 0.22 Howard Tinberg, From "Self-Righteous Researcher" to "Fellow Teacher", College Composition and Communication, 2006. 0.22 Carol Rutz, Recovering the Conversation: A Response to "Responding to Student Writing" via "Across the Drafts", College Composition and Communication, 2006. 0.20 Robert J. Connors Andrea A. Lunsford, Teachers' Rhetorical Comments on Student Papers, College Composition and Communication, 1993. 0.18 Anne M. Greenhalgh, Voices in Response: A Postmodern Reading of Teacher Response, College Composition and Communication, 1992. 0.18 Elaine P. Maimon, A Comment on the Response of C H Knoblauch and Lil Brannon, College English, 1985. 0.17 Catherine Lynch Patricia Klemans, Evaluating Our Evaluations, College English, 1978. 0.17 Patricia J. McAlexander, Advantages of the Cumulative Comment Sheet in Composition Classes, College Composition and Communication, 1988. 0.17 Nancy Sommers, Responding to Student Writing, College Composition and Communication, 1982. 0.16 C. W. Griffin, Theory of Responding to Student Writing: The State of the Art, College Composition and Communication, 1982. 0.16 Nancy Sommers, Across the Drafts, College Composition and Communication, 2006. 0.16 Louise Wetherbee Phelps, Surprised by Response: Student Teacher Editor Reviewer, JAC, 1998. 0.16 Anne J. Herrington Deborah Cadman, Peer Review and Revising in an Anthropology Course: Lessons for Learning, College Composition and Communication, 1991.